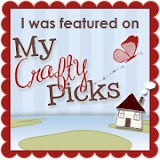 Porch Swing Creations: Dazzling Wildflower Meadow & New Catty Time! Happy Friday & New Catalog Day!! I'll share some other exciting news a little later on, but for now let's get to the card! 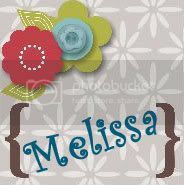 The set I used here is brand new to the catalog line up; called Wildflower Meadow. Its a large image stamp but with oh so many possibilities! Here I paired it with a technique called Glitter Window which of course adds shimmer and a pretty watercolor look. I wish the photo did the real thing justice - those Dazzling Diamonds look amazing!! Begin with a piece of Crisp Cantaloupe cardstock measuring 5 1/2" square. Center the largest framelit from the Floral Frames and run through the Big Shot (keep the cut out piece as well). On the backside apply packing tape so the sticky side faces outwards. Sprinkle liberally with Dazzling Diamonds and shake off excess. Set aside. 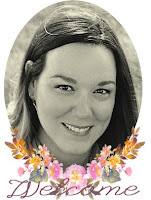 Color the Wildflower Stamp using SU! markers and stamp onto a piece of Whisper White cardstock measuring 4 1/4" x 5 1/2". You will notice that the stamped image is too small for the framelit, that's ok we'll deal with that next. 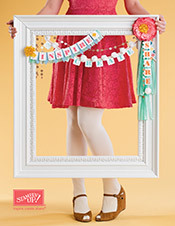 Line up the image behind the glitter window; offsetting to the right (leaving empty space on the left) and glue together. Take the punch out from the framelit you set aside earlier and stamp "HAPPY BIRTHDAY" in Basic Black so that it aligns across 3 petals. 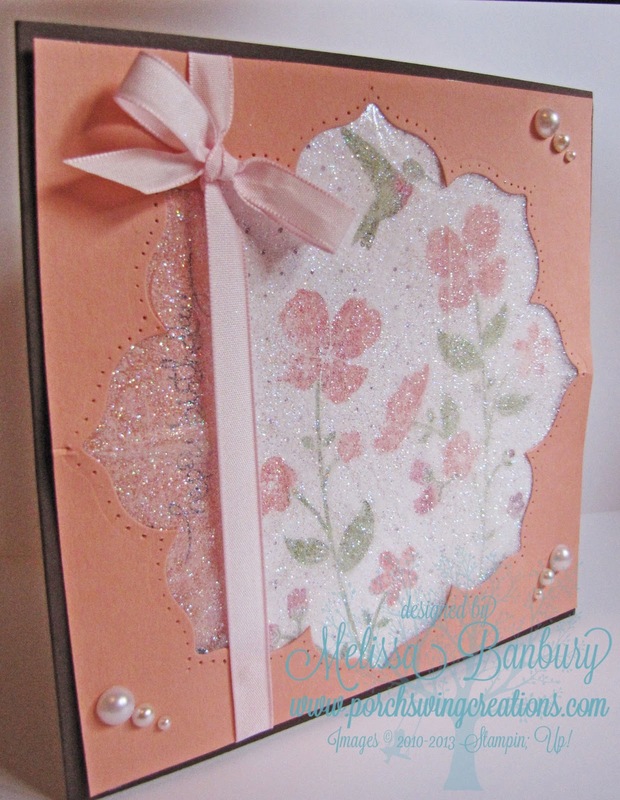 Layer this behind the Whisper White layer and the glitter window to fill in the empty space and adhere all three layers together. Using a piercing tool, outline the outside of the Floral Frame. Add a piece of ribbon where the lines of the layers meet and tie into a bow. Add pearls to the corners for interest. Adhere the layers with dimensionals onto a piece of Chocolate Chip cardstock measuring 6" x 12". So, want to get your hands on the new catalog, or at least take a peek online? Simply click on this image in the left hand sidebar and it will take you straight there to check out all the exciting new products! 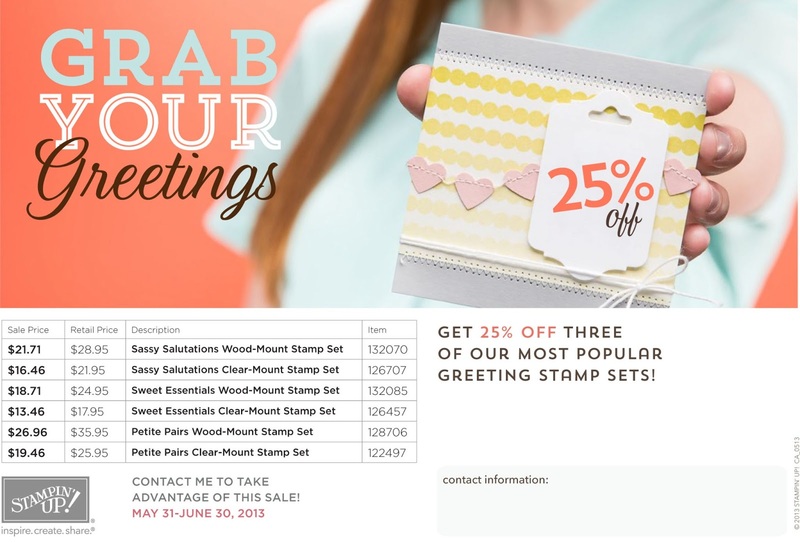 Other exciting news just out today - Stampin' Up! 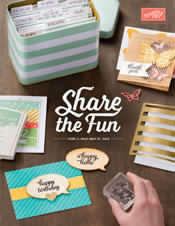 is having a sale called Grab Your Greetings for the month of June. They are offering 3 Greeting sets; Sassy Salutations, Sweet Essentials, and Petite Pairs for 25% off! That's a great savings on sets that go with everything and help finish off a card! See you all back here next week! I'll be sharing June's tutorials for purchase - CREATING LANDSCAPES & LIGHT SOURCES!